EASY TO USE -- Start copying your master discs in minutes -- no lengthy training, no complicated software or hours and hours of instructions needed. Everything is done with a few simple front panel controls. This user friendly machine will easily copy your own DVD master discs (DVD-ROM, DVD-R/RW, or DVD+R/RW). You can copy onto your choice of all four popular type DVD discs, DVD-R, DVD-RW, DVD+R or DVD+RW at up to 8x speed, copying a full 4.7GB capacity, 120 Minute ute disc in about 9 minutes per disc copy. Copies 1 master to one DVD+R or DVD-R or RW. NOTE -- No copy protected DVDs may be copied using this system. Your original master disc must be less than the usual DVD+/-R/W capacity, or less than 4.38gb to fit onto these discs (or about 110 minute actual run time). Easy to use controls and display are located on the top of the case for your convenience. 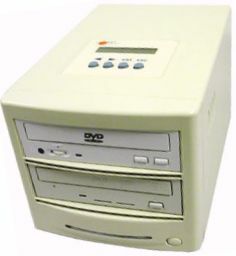 RELIABILITY AND COMPATIBILITY -- The included DVD writer drive used in this model duplicator is the famous and very reliable Plextor PX-708A model drive. It burns +/-R discs at 1x, 2x, 4x, or 8x as appropriate for the matching media being used. You can depend on this drive, since it is truly the standard for the industry. This model is firmware upgradable, should the need arise. Fully stand-alone 1 to 1 DVD-duplicator device.